As most of us know, that strange subculture called "UFOlogy" has its own peculiar madness concerning a belief called "Disclosure": the belief that governments (especially the U.S. government) have long secretly known about extraterrestrials - perhaps have even been communicating or cooperating with aliens - but have kept it top secret. And that supposed "secrecy" is about to end. This is the equivalent in the UFO religion (for that's what it is to many people) of the "Second Coming" of Jesus in the Christian religion: a joyous event eagerly anticipated for over two thousand years, but hasn't happened yet. The latest instance of Disclosure Mania purports to come from the hacker group Anonymous, best known for its attacks on Scientology. It is a mishmash of irrelevant quotes from NASA having nothing to do with discovery of ETs, hoax UFO photos, and general stupidity of the highest order. Watch it, and weep. there’s just one small problem: NASA wasn’t hacked, and Anonymous Global isn’t Anonymous. That’s right. This breaking news flash, urgently recycled and regurgitated throughout many respected realms of cyberspace, is based entirely on a bogus claim from an opportunistic Youtuber that has shamelessly commercialized the likeness of Anonymous – the true heroes of hacktivism. But what’s even worse is that no one even seemed to notice. In fact, everything that Anonymous Global “reveals” is actually based on public information. That is to say, the extent of this supposed ‘NASA hack’ is limited to openly accessible, non-classified data that anyone can find simply by browsing the web. 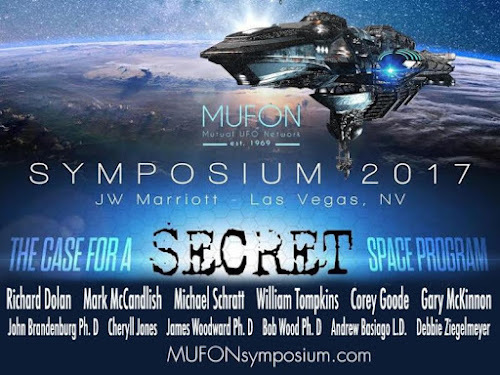 Simultaneously, there is a frenzy surrounding the forthcoming MUFON Symposium in Las Vegas July 21-23. A lot of this surrounds 94-year-old William Tompkins, who has been telling his rambling stories about Reptoids, Nordics, Nazi saucers, and similar nonsense to pretty much anyone who will listen. A speaker at the July Symposium, Tompkins is set to "reveal 60 years of secrets on the Secret Space Program." Talking with some of the MUFON folks, it appears that all kinds of rumors are swirling around concerning what kinds of UFO revelations (supposedly) will happen in conjunction with the 2017 Symposium. Supposedly there will be some huge, worldwide Disclosure event, backed by big money. I wouldn't hold my breath waiting for it. Meanwhile, rocker Tom DeLonge continues to post meaningless stuff on Facebook, stringing people along who are breathlessly waiting to hear the UFO Disclosure announcement that he promised in "sixtyish" days on February 15. It has now been more than onehundredtwentyish days since that promise, twice sixtyish days, with nothing tangible in sight. -Get a revelation of the 14 magicians in charge of this secrecy. - Find out who the 5 Messiahs are, the ones chosen to carry out the disclosure message. - Learn the 64 reasons that led United States presidents to keep the UFO information secret. - Discover what WikiLeaks has revealed about UFOs. - Learn of the latest disclosure effort by rocker Tom DeLonge. -Become aware of a US president that was abducted. - Understand the story of "Trump the Aliens." - Gain insight on Trump's UFO briefing. - Learn about the eight possible disclosure efforts being run at the present time including the disclosure of a portal. Lara Logan (CBS): Do you believe in aliens? Many UFO proponents found great significance in this. Coast to Coast radio said, "The tantalizing exchange and the serious nature with which it was presented was remarkable for a primetime program on national television, especially the venerable 60 Minutes." But Bigelow was simply re-stating his well-known personal beliefs about UFOs, said nothing new, and presented no evidence of any kind. The one and only full-time lobbyist for Extraterrestrials and Disclosure, Stephen Bassett of the Paradigm Research Group, went to Russia in May to talk about Disclosure. He is now suggesting that Russian president Vladimir Putin may be the first world leader to disclose extraterrestrials, beating the U.S. government in the new space race, the one for UFO Disclosure. Bassett was the organizer of the farcical "Citizens Hearing" on UFOs at the National Press Club in Washington, DC in 2013. Intended to raise public awareness of, and interest in, UFOs, it didn't accomplish much. In fact, according to the website Parapolitical, "Google Trends actually recorded a decrease in online interest in the term “UFO” during the carnival." There have been rumors of "UFO disclosure" almost as long as there have been UFOs. Believe it if you can. I promise, we really will have Disclosure this time! In Search Of "Progress" in UFOlogy - At the End of the Road? As those of you who follow the UFO Blogs and postings already know, the most recent cry of this kind comes from the Spanish UFOlogist Vicente-Juan Ballester Olmos. Olmos has been researching UFOs for fifty years now, and since the year 2000 has been concentrating his efforts on FOTOCAT, a world-wide catalog of UFO photo events. Many researchers have assisted with this collection, myself included. Olmos is well-respected among UFO Realists (those who attempt to adhere to facts (more or less) in investigating UFOs, as opposed to the Unrealists who are always ready to believe exciting UFO stories with little or no proof). In Jacques Vallee's autobiographical Forbidden Science (Volume 2), he mentions in an entry for 1970 that he has been corresponding regularly with Olmos concerning reported Spanish landing cases. In fact, Vallee mentions Olmos several times in that volume. You won't find anyone with better UFO street cred than that. Let me be perfectly clear: the UFO phenomenon holds transcendent significance only insofar as it results from extraterrestrial life visiting the Earth. It is this possibility that made the ETT popular and compelling from the start. But I fear that 70 years of air incidents, close encounters, radar returns, photos and videos and other seemingly astonishing experiences do not sum up to proof that such visits have taken place. This conclusion, coming from a man who has been at the forefront of UFO research for fifty years, is devastating. He follows it up with a piece by his colleague Thomas E. "Eddie" Bullard, professor emeritus of folklore at the University of Indiana. Frankly, this piece surprised me at least a little. I have met Bullard several times at different UFO conferences (I have corresponded with Olmos, but never met him), and came away with the impression of Bullard as a True Believer in the UFO Abduction Phenomenon, as taught by Hopkins-Jacobs-Mack: we have done the studies, we have the evidence, alien abductions are established fact. 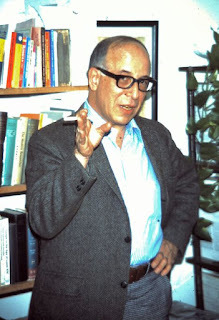 He participated in the Encounters at Indian Head conference ("Betty Hill's Last Hurrah") in 2000, where he suggested that the Hills' close encounter and abduction narrative were probably based on real events. 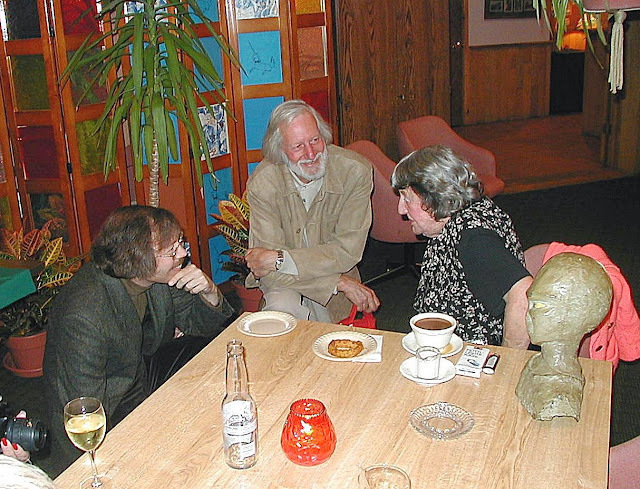 Eddie Bullard (left) and the late Hilary Evans chat with the late Betty Hill in 2000. On the right is "junior," Betty's supposed UFO abductor, as sculpted by Marjorie Fish. It was Bullard who established the eight "elements" of UFO abductions, a general guideline that would supposedly help sort out 'authentic' alien abduction experiences from delusions. 1. Capture. The abductee is forcibly taken from terrestrial surroundings to an apparent alien space craft. 4. Tour. The abductees are given a tour of their captors' vessel. 6. Return. The abductees are returned to earth. Occasionally in a different location from where they were allegedly taken or with new injuries or disheveled clothing. 7. Theophany. The abductee has a profound mystical experience, accompanied by a feeling of oneness with God or the universe. 8. Aftermath. The abductee must cope with the psychological, physical, and social effects of the experience. These "elements" were taken seriously for a time, but received a serious blow when Martin Kottmeyer showed that only one account in Bullard's "abduction" catalog has a greater number of correctly-ordered "elements" than the fictional alien abduction by the Tiger Men of Mars in a 1930 Buck Rogers comic strip. Kottmeyer attributes this to the "elements" being what is requisite for good storytelling. serve as an obituary for a failed quest. I do not want to hear that we have tilted at windmills for decades, but sadly, I have to agree with most of what he says. As might be expected, this double whammy from Olmos and Bullard has gotten a lot of attention from serious students of UFOs. Chris Rutkowski, who for decades has been collecting and evaluating UFO reports in Canada much as Olmos has been in Spain, wrote in the Facebook group UFO Updates, "He's right." Researcher Curt Collins, blogger at Blue Blurry Lines, wrote "Wow, that's a brutally honest assessment." UFOlogy cannot become a science, because it has no real data that it can study. Of course there are accounts from "reliable witnesses," but it has become increasingly evident in recent years that "reliable witnesses" often aren't. 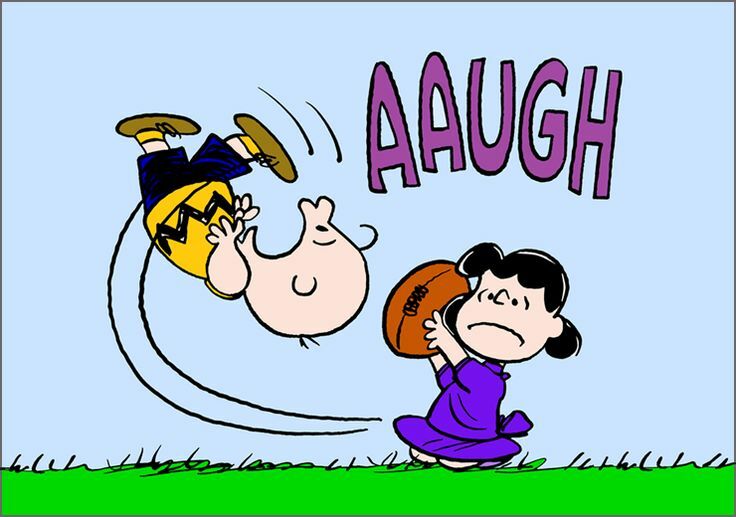 So there is nothing truly solid on which to base any theories about a supposed UFO phenomenon, separate and distinct from other known phenomena. Given the inherent fallibility of human eyewitness testimony, the real question should be: how often should we expect to find seemingly credible and extraordinary UFO accounts, even in the absence of any extraordinary stimulus? UFOlogists assume that the answer is "zero," which is obviously wrong. One might indeed say that when one does not know whether watermelons are a distinct category from the oranges, and thus cannot exclude the possibility that they are measurement errors of oranges. One can often find seeming patterns in random noise, but such correlations always disappear with time (like a gambler's "lucky streak"). UFO old-timers might remember the "pattern" that David Saunders thought he recognized, suggesting in 1971 that waves of UFO sightings repeat about every 61 months, and seem to move eastward by about 30 degrees of longitude. That "pattern" has fizzled out quite completely. What Olmos is saying is that the traditional approach to serious UFO research - what might be called the Hynekian paradigm - investigating reports from credible individuals, investigating alleged physical effects, photos, and videos - has reached a complete dead end. And nobody (thus far) has mounted a vigorous defense to try to prove him wrong. But this grudging admission will have no effect whatsoever on what is sometimes called "Retail UFOlogy," the large number of Unrealist consumers of UFO materials and those who pander to them for fun and profit. Most of those people probably have no idea who Olmos or Bullard are. Instead they eagerly devour high-octane UFO and alien stories from the likes of Steven Greer, David Wilcock, George Noory, etc., and find them highly interesting. No matter how long you live, you will never know any more about UFOs than you know today. You will never know any more about what UFOs really are, or where they come from. You will never know any more about what the U.S. Government really knows about UFOs than you know today. As you lie on your own death-bed you will be as mystified about UFOs as you are today. And you will remember this curse. Another way of looking at Olmos and others' admissions of UFOlogical defeat is that they have run into, and recognized, the fundamental limits to our UFO knowledge set by Klass' UFO Curse.